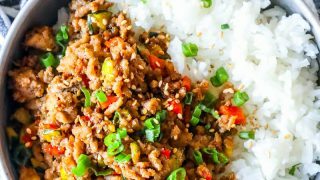 Easy Mongolian Turkey and Rice Bowls Recipe – deliciously easy ground turkey and rice bowls in a spicy sweet Mongolian sauce that the whole family loves! 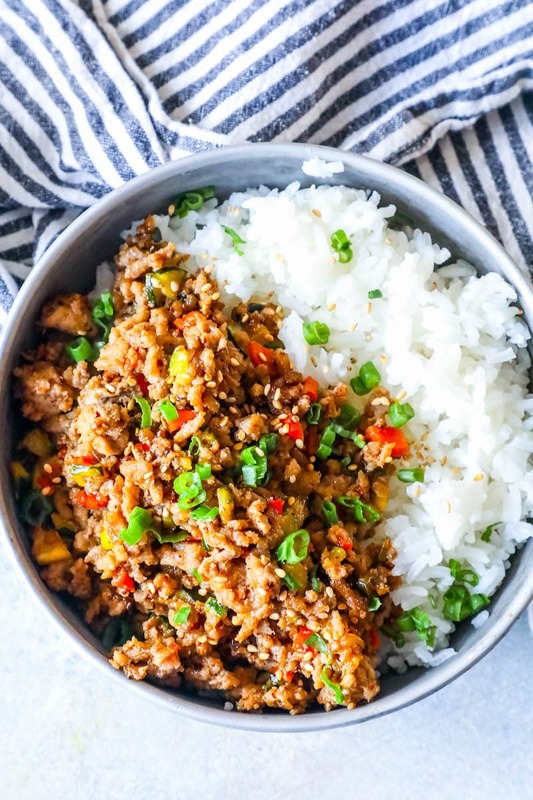 If you love a little bit of sweet, and a little bit of spicy – but a TON of flavor – this easy Mongolian Turkey and Rice Bowl Recipe is for you. Next day leftovers are delicious for this Mongolian turkey rice bowl recipe – simply pop in the microwave for 2-3 minutes until warm and tuck in! Just Take Me To The Best Mongolian Turkey and Rice Bowls Recipe Already! 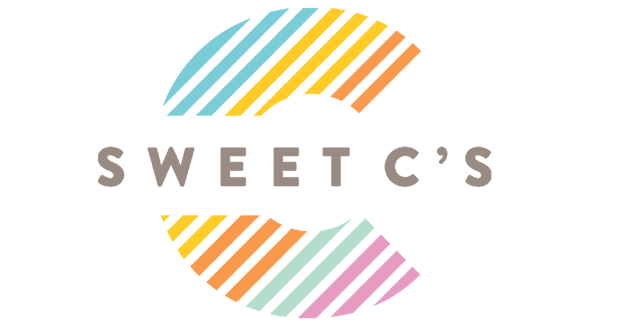 I get a ton of questions, comments, and requests for similar recipes from readers – so I try to pack as much information as possible into my posts. 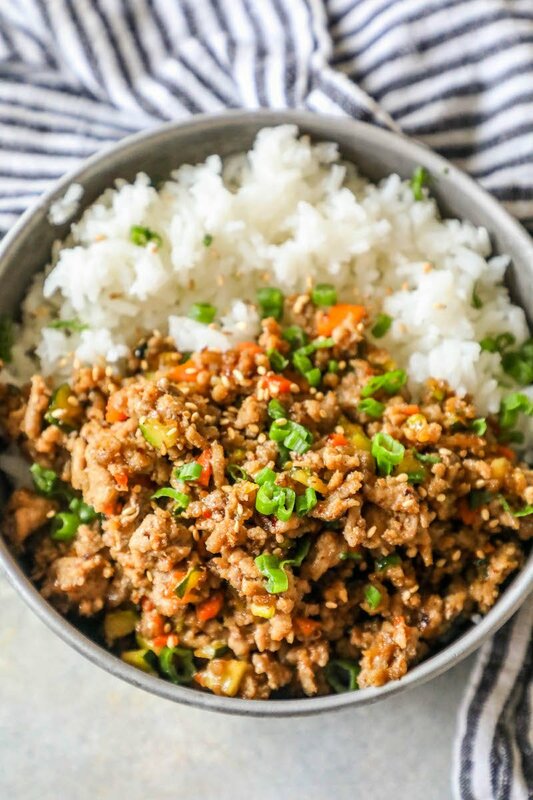 If you’d prefer to skip over my tips to get the best Mongolian turkey rice bowls, please skip to the bottom of the page where you will find the easy printable recipe. 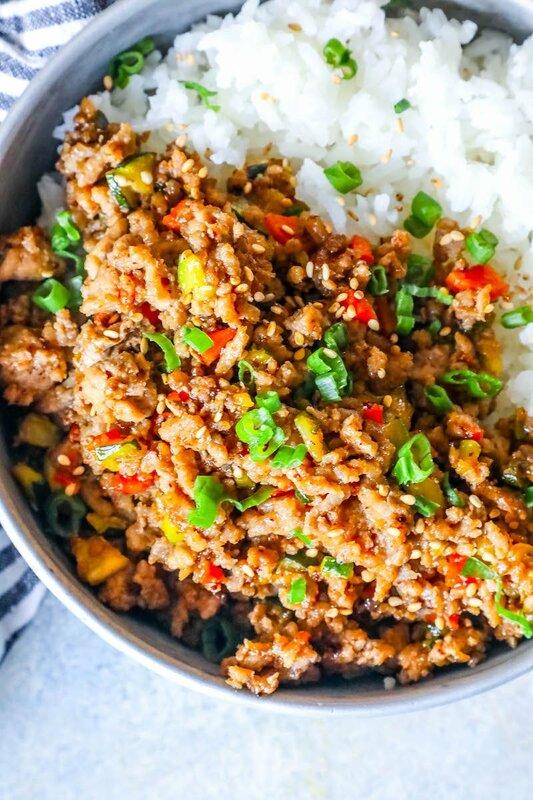 Mongolian Turkey gets it’s rich sweet and spicy flavor from Mongolian sauce – a blend of soy sauce, hoisin sauce, sugar, and garlic – as well as some red pepper for heat! This sauce is incredibly simple and goes perfectly with ground turkey for a healthy and filling meal your whole family will love. Mix all ingredients in a small bowl and use over meats, vegetables, or seafood. This sauce makes perfect Mongolian Beef, Chicken, and even shrimp – so be sure to write it down for later! If you’re looking for perfect fluffy, thick, and slightly sticky rice – the kind that scoops easily even with chopsticks – you’ll want to be sure to follow my tips to make the best rice for rice bowls. For every cup of dry rice, use 1 3/4 cups water and 1 tsp salt into the water. Bring salted water to a boil in a pot that you have a lid that fits tightly onto. -Add rice to boiling water. Give a quick stir to rice after adding to water so it doesn’t stick to bottom of the pot. If making rice to serve alongside food, you don’t want to stir the rice almost at all, since it will cause the rice to get a bit stickier. In this recipe, we want rice to be a little sticky, but not too sticky. To do that, stir a couple times when rice is boiling to prevent clumping, and once when simmering to make sure nothing is stuck to the bottom of the pan – no more. -Cover the pot and simmer. Turn heat to as low as it can go, and simmer for about 19 minutes. -Remove from heat and let steam for another 5 minutes. Keep the heat trapped inside, don’t remove the pot lid. -Fluff rice with a fork. Just before you serve rice, fluff it with a fork to separate grains and help it from settling into clumps. 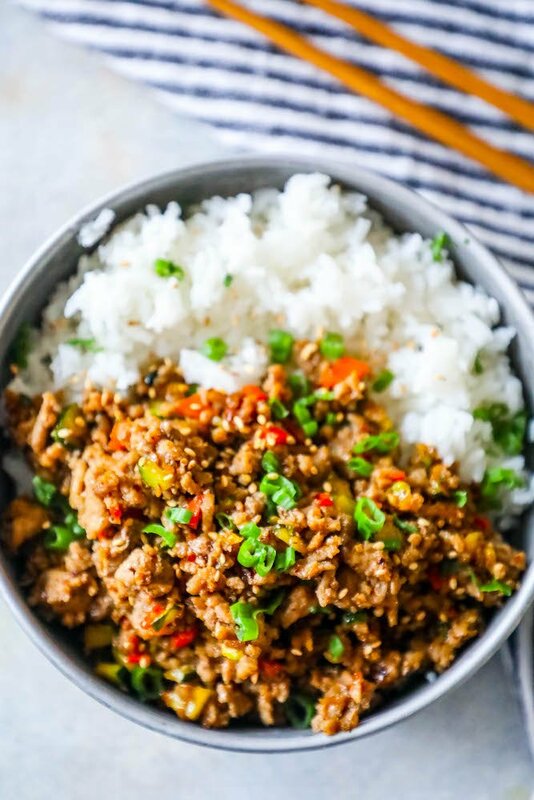 If you love this easy mongolian turkey and rice bowls recipe as much as I do, please give it a five star review and help me share on facebook and pinterest! 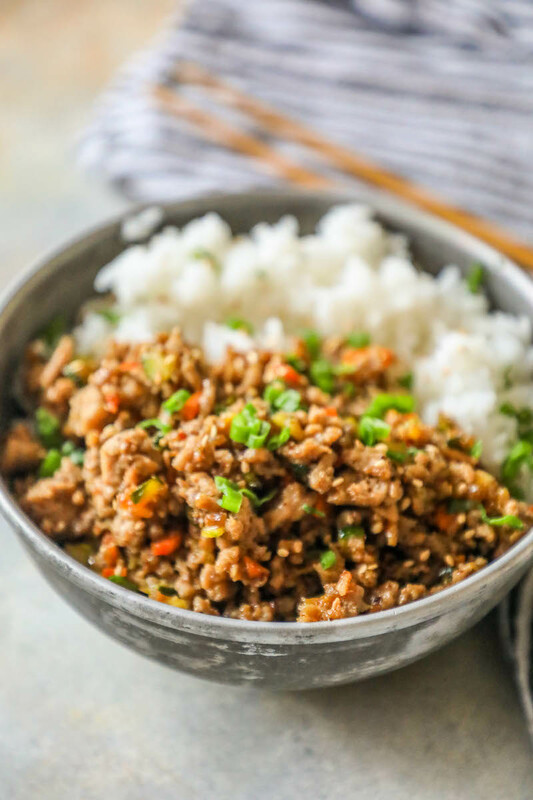 Easy Mongolian Turkey and Rice Bowls Recipe - deliciously easy ground turkey and rice bowls in a spicy sweet Mongolian sauce that the whole family loves! Start boiling water and add salt as you begin to cook ground turkey. Watch for water to boil, and add rice. Let rice boil 2-3 minutes, stirring 1-2 times to prevent clumping. Reduce heat to as low as possible and cover to cook for 19 minutes. Fluff rice with fork just before serving. In a large, heavy pan, add olive oil and heat on medium high heat until shimmery. Add ground turkey and break apart with a spatula as turkey browns. Add in onion, pepper, and garlic and brown with turkey, stirring occasionally to prevent sticking and burning. In a small bowl, add sauce ingredients and stir. Add sauce to pan and toss turkey and vegetables. Turn heat to low and wait for rice to finish. When rice is done, fluff and scoop into bowls. Top with ground turkey in sauce, and garnish with seasame seeds and green onions.